The Rockabilly Legends Project has assembled a monumental music collection featuring the pioneers of Rock ‘n’ Roll who originally recorded with Sun Studios. These digitally remastered songs are from over 30 legendary artists. Jerry Naylor, who produced this project, also created 4-CDs as a “Tribute To My Friends”. The full collection features 113 original hits with over 50 new tracks. A total of 7 hours of music, plus a 3-hour DVD Documentary. View all Rockabilly Legends products. The Rockabilly Legends: A Tribute to My Friends anthology transports you from the Depression-era cotton fields of Arkansas, Tennessee and Texas, into the southern juke joints, honky tonks, recording studios and rural churches for a passionate journey with the pioneers of Rockabilly and Rock and Roll–pioneers named Elvis Presley, Johnny Cash, Carl Perkins, Roy Orbison, Buddy Holly, Jerry Lee Lewis, Buddy Knox, Gene Vincent, Johnny Horton, and The Johnny Burnette Trio. Conceived, written and produced by Jerry Naylor, former lead singer of The Buddy Holly Crickets, this is a restoration and preservation of an era that changed music forever. Here, the legends themselves reveal the earthy story of how Rockabilly and its founders changed a generation and influenced all music that followed. Within this story, you will discover why . . . They called it Rockabilly long before they called it Rock and Roll. 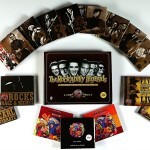 Sample it now: View Selected Video Interviews from the Rockabilly Legends Documentary DVD. "These young men had no idea who they were going to become, or how profoundly they would change the world. In fact, Rockabilly music laid the foundation for everything that came afterward. If it wasn’t for the Rockabilly Legends we wouldn’t have Pop, Metal, R&B, Techno… or much of anything else."